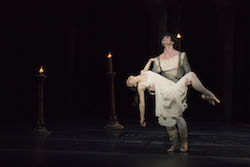 Paulo Arrais and Misa Kuranaga in John Cranko's 'Romeo & Juliet'. Photo by Liza Voll, courtesy of Boston Ballet. Boston Opera House, Boston, Massachusetts. There’s certainly something to be said for adapting classic tales for the modern era, so that they’re more accessible and appealing to modern audiences. On the other hand, resurrecting the classics in pure form can offer contemporary viewers magical worlds into which they can escape – where they can forget their stressful modern-day obligations and enter a yet-unexperienced world. 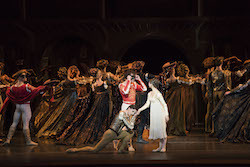 Paulo Arrais, Misa Kuranaga and Florimond Lorieux in John Cranko’s ‘Romeo & Juliet’. Photo by Liza Voll, courtesy of Boston Ballet. 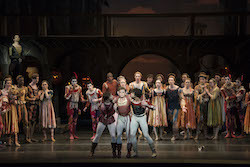 Boston Ballet’s restaging of John Cranko’s Romeo and Juliet (which first premiered with the Stuttgart Ballet of Stuttgart, Germany in 1962, with a Boston Ballet premiere in 2014) allowed for this magic through an authentic illustration of Medieval Italy. At the same time, Cranko’s choreography had clever character flourishes and neo-classical elements that spoke to modern mentalities. Both well serve Shakespeare’s tragic tale of “star-crossed”, fated young love. The company showed its high level of skill in both technical execution and authentic character portrayal. After a meandering and lilting overture, the curtains rose to reveal the busy, vibrant streets of Verona, Italy. The animosity between two factions, one in costumes of red tones and the other in those of blues, soon became clear; they eyed each other with scorn and crossed swords. These were the feuding Capulets and Montagues. With training and guidance from Swordmaster Angie Jepson Marks, the company appeared quite adept at handling their stage weapons. Costumes by Jurgen Rose (in 1968) also felt fully authentic, ornate yet not superfluously decorative. Scenery (Design also by Rose) offered windows, balconies and iconic Mediterranean poplars. It all contributed to the authenticity of the scene at hand. 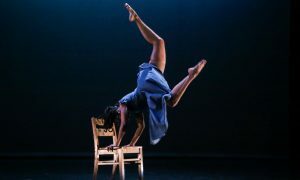 The movement also created an authentic feeling of a bustling, tight-knit community – codified but not overly complex, and often performed in small groups. Isaac Akiba, Derek Dunn and Paulo Arrais in John Cranko’s ‘Romeo & Juliet’. Photo by Liza Voll, courtesy of Boston Ballet. Sauté arabesque into promenading the step became a repeated phrase of a few strong danseurs. Larger groups did multiple emboîté steps – a hop with one leg in attitude, and switching quickly to the other foot on the next count. With these phrases, Cranko’s style became evident – repeated phrases of basic movements, elegantly sequenced and presented. The next such phrase came just before the Capulet party scene, a few young Montague men playfully plotting to crash it. They quickly shifted from foot to foot, with arms rippling like snakes, to then passé battu and double tour. In the party, Capulet men shifted back and forth in lines, to freeze in place for Capulet women to walk in between their lines. The women laid their head back, puffed their chest up and forward, and lifted their top skirts to hip-height – all in utmost elegance. All were masked, per the party custom in the story’s time and place. Yet Romeo (Paulo Arrais) and Juliet (Misa Kuranaga) caught a glimpse of each other, and found a private corner to take off their masks to see one another in full. It was truly instantaneous love. They lunged in fourth position, arms reaching back toward the other – legs and port de bras together creating a gigantic heart shape. They then turned toward each other and came to parallel relevé, bouréeing with arms at shoulder height to reach toward the other. This was a lovely way to convey powerful love in a short movement phrase. Paulo Arrais and Misa Kuranaga in John Cranko’s ‘Romeo & Juliet’. Photo by Liza Voll, courtesy of Boston Ballet. They next shared their first pas de deux. Juliet melted into Romeo, one leg looping around him in low attitude. Their next pas de deux came at that infamous balcony scene. Arrais had a wonderful way of stretching out movement in time, yet still staying right on the music. In one memorable phrase, he offered a piqué arabesque out toward the audience, then turned back toward Juliet, to repeat the phrase again – in true Cranko style. Kuranga’s extensions had a captivating feel of lengthened energy. The next act, “Tarantella” (a culturally Italian dance form), brought us back to the energetic Verona streets. 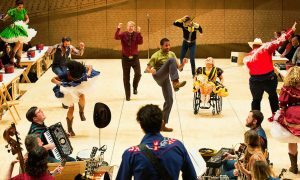 It began with a tight circle, complex and fast petit allegro from dancers inside – the Gypsies (Hannah Bettes, Ji Young Chae, Dalay Parrondo) with outer dancers cheering them on. Next, they moved into spinning lines with dancers joining arms, and a repeated phrase from the Gypsies of flat back attitude turn into pirouette. It had the truly authentic feel of a street party. This act could have been Cranko’s way to include more dancing, in a pure form without plot associations, in the show. After this was mainly movement-heavy pantomime to tell the rest of Shakespeare’s story. Anyone who wasn’t already familiar with the story could use the program’s synopsis to follow certain complex plot points – such as Romeo killing Tybalt (Eris Nezha), Juliet’s cousin, a Capulet – in revenge for killing his friend Mercutio), or that the potion Friar Lawrence (Mamuka Kikalishvili) gave Juliet would make it appear that she had died, for 12 hours – long enough to avoid marrying Paris (Florimond Lorieux), and thus committing the sin of bigamy. Cranko’s choreography and Jane Bourne’s staging did well with this immense challenge of conveying in movement an intricate, involved plot. A challenge to recognize is reading that synopsis in a dark theater. 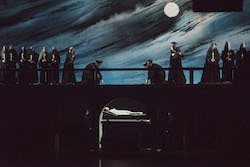 Then came a last ensemble section, before Juliet’s mother found her “dead” (really just in a deep sleep, such that her heart rate wasn’t even detectable). Bridesmaids in white dresses danced with small arches of flowers, looping them through space while turning and leaping with poise. Varying levels and lines spreading across the space underscored the joy of the occasion (or what could have been the joy, on any other typical wedding day). 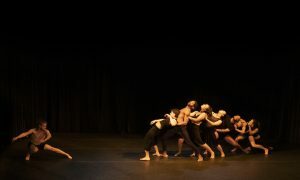 Dancers in a straight line alternated sous-sous and a grounded lunge as they circled their flower arches, creating a visually striking zig-zag effect. Boston Ballet in John Cranko’s ‘Romeo & Juliet’. Photo by Liza Voll, courtesy of Boston Ballet. The story ended in the dark and ominous catacombs (underground burial chambers used in the middle ages). Again, the set and lighting created a realistic atmosphere for the scene. The tragedy came in the timing. First Romeo only just missed a letter from Friar Lawrence explaining that Juliet wasn’t really dead (not conveyed in Cranko’s adaptation, perhaps understandably so, as difficult as that could be to convey on stage without words). Seeing her dead, he took his own life by stabbing himself. Juliet then awoke to see her love dead. She took Paris’s dagger (who had been mourning, when Romeo confronted and killed him) and followed Romeo’s lead. The curtain lowered on them lying dead on Juliet’s burial bed. Arrais and Kuranga gave all of themselves to the unfolding drama, taking us in with them. It was all part of how the tale, however tragic, could take us out of 2018 and into another world – one where true love matters above all else. Yuki Ozeki helps bring ‘The King and I’ to life.